Every morning I wake up at 5:30 to a large presence of crows outside my window. They start to bark like clockwork—they cling to the trees and they caw for a good 90 minutes until they move in unison to Oak Park, a block away. Sometimes I wonder why they are in my back yard every single morning. Don’t get me wrong, I am not complaining—I love the black birds, but I am often curious why they hover there in the early morning while there’s plenty of good food just a stone’s throw away. There’s only one logical reason for the crows being outside my window every morning—the birds are there for my benefit. They are there to wake me up. I mean really wake me up. They don’t rouse me from sleep so I won’t be late for work, but rather remind me of what is occurring in the present moment—to awaken me to the sounds, to the dawning of a new day, to my breath, to my existence on this planet in that very moment. I quietly listen to these black birds in meditation. I give them my undivided attention. They are my focus, my drishti. I close my eyes and listen to the number of caws they make, the different kinds of graveling sounds and almost hysterical cries that come from deep inside their souls—and then listen to the silence between the noises. I listen to all of it, inhale it all deep into my lungs, into my heart space and I try to be present with it at the edge of my bed, with my feet on the floor, firmly rooted to the earth. When the crow noise stops, so does my morning meditation and I begin a new day. One bird usually caws five times. The speaker then waits for a response and within seconds a crow calls out, like an echo, like a ripple in a pool of water. This communication occurs repeatedly as the birds get their ducks in a row, so to speak, before they start their daily routine. They may plan to forage for food or look for things to build or repair a nest. Whatever their plan, it is just as meaningful as ours—I’m sure of that. I notice crows working hard, carrying sticks, searching for tools—working together as a group in the trees, atop the roofs, the telephone lines—it is always “we” and never “me.” They are selfless and loyal, dependable, reliable and true. They cry out when there’s trouble, they caw in fear; they work to solve their problems, cloister together when signs of danger are at hand. The crow family teaches me many things. They teach me to appreciate life. Each day they wake up and go about their day with exactly the same fervor as they did the previous day. They are fully alive, fully present in the world—and they have a strong voice. They speak what they feel and know what they say. There is no mincing of words with crows—no double-talk for these feathery creatures. What they say comes from their heart, comes from their very soul. 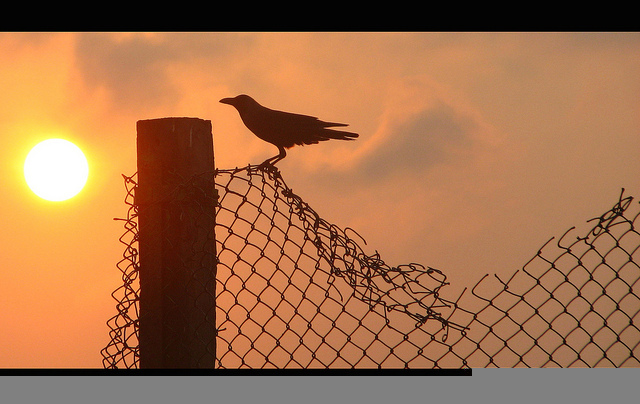 Crows react fast; they make very wise and decisive decisions. They are firm and steadfast. We hurt a crow once; it won’t happen twice. They move away from us in a blink of an eye. They are survivors, first and foremost—that is their calling. Crows never forget a face. They never trust us completely—they know our patterns. They study us from head to toe. They know us inside and out with the same intensity and precision as a heart surgeon. As a daily meditator, I take my crow experience to the Zafu cushion. I meditate on their strength and courage and keen sense of reality. I meditate on their smart and effective ways in which they problem solve. I have a sense of their presence that has somehow made me a stronger and much more aware person. I dwell on the very presence of the crows that have, luckily for me, gathered outside my window to practice their craft and to model their skill. I am fortunate enough to be open and mindful of their beauty and wisdom, and to know that their very existence makes me aware that I am alive and that I am here. There’s no better place I’d rather be then in the moment. Mark Tulin is a yogi and practices mindful meditation on a daily basis. 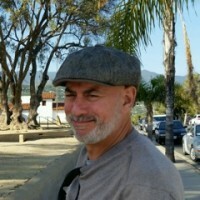 He has been published in Yahoo Contributor Network, Santa Barbara Independent, The Family Therapy Magazine and others. Mark likes to write about a wide range of topics from foods to yoga with wit and sincerity. He is a former family therapist who practiced over twenty years. He has two adult children and lives in sunny Santa Barbara, California with his beautiful girlfriend, Alice. His blogs can be read here.